I’ve always loved this diminutive wall sculpture 🙂 which is NOT diminutive in my artist eyes & mind!! It never did sell down in Houston. The little creature traveled with me a couple of times to different states, and finally I sold it to a friend of mine – doctor’s wife, for her husband’s birthday. That sort of sale is always a scary thing for me. A lot of times I’ve experienced an enthusiastic spouse but the other spouse wasn’t enthusiastic at all. And if the enthusiastic spouse be female, “occasionally” it has appeared (like a big truck) that hubbo was a bit more than unenthusiastic, if you be getting my drift. Well I don’t want to drift along like an iceberg – ready to ram the Titanic of marriage voyages . . . yikes. Still, being an artist trying to sell his or her art follows a simple formula that was succinctly explained to me by my most excellent artist friend (both artist & friend) Ron K Smith many long years ago down in Houston, TX. Believe them (public art buyers) when the check is in your hand! This simple statement runs counter to many folks romantic idea of what it’s like to be an artist. I’ve heard both ends of the spectrum actually. There isn’t a lot of middle ground and Ron’s handy art measuring guide is very useful, as it does lie firmly in the middle ground of artist reality (a place that seems to be getting harder ‘n harder to locate for everybody). SO, the glamour of being an artist is (partial fun list): full of a lot of alone time – painting, sculpting, printing, priming, sanding, crating, uncrating, etc. Also, calling dis-interested gallery owners & entering shows (well I’ve been sho nuff lazy ’bout that – got me a good violin soundtrack goin’ now!! Yes, there’s plenty o’ rejection from galleries for most of us (but as Dean Andrew Martin says, “It’s a numbers game – Just keep entering.” That doesn’t seem to bother some artists. They just move on down the gallery row list. But some of us are sensitive artists like yours, too-ly! haha I don’t like no rejectins. Still, do it enought and it gets easier. Not sure it gets quite as glamorous as a job at the art supply store, though 🙂 Meet lots of artists there, male & female. Move to the big city, like Houston – Texas Art Supply has tons of folks buying their art supplies there. I worked there for 4 years. I met lots of art people. Not glamorous but could be fun for an isolato artist like me. Still . . .
For me, the most glamorous parts are those times (and not every day, when the pieces of the art jig-saw puzzle fall into place and I see something new &amp; amazing on my easel or wall! WOW! Often this is 3AM, 4AM, or 5AM. Almost always it’s when I’m totally alone! Just me, my brushes, and my cats!! That’s when I’ll often have my music turned way up and my ancient dancin’ feet going a mile a minute… Or, I’ll be sitting in my special art chair just gazing at what I just finished painting – wondering how that got painted exactly… and… wondering if I will be able to make such magic happen again. Because often I’m not too sure how it did happen anyway. But the wondering doesn’t drown out the feelings of awe at these times! Be that as it may, It was late 1984 and I had quite a few of the little wall sculptures finished. I thought they looked strong – a solid direction to present to a gallery. And life was pressing in on us. Things back home were not good. My parents were going through it and every time ET phoned home the news seemed worse. Bad for them, but sort of a sword dangling over my head to work my tail off to present to art galleries. Why my parent’s plight affected me directly like it did I’m not entirely sure. My existential artist plight was drenched in family drama at that time. So, I got up my nerve and called a gallery (big deal for me). She seemed to like my work but informed me the next day that my work was not a fit. I was disappointed but it was only the first gallery I’d called, so… I recovered quickly and in a day or two called the director of Kauffman gallery – which I felt drawn to already. I’d attended shows there and (years before) hoped someday I would show my work in their attractive gallery space. The Kauffman director, Leigh Smitherman, caught me off guard. 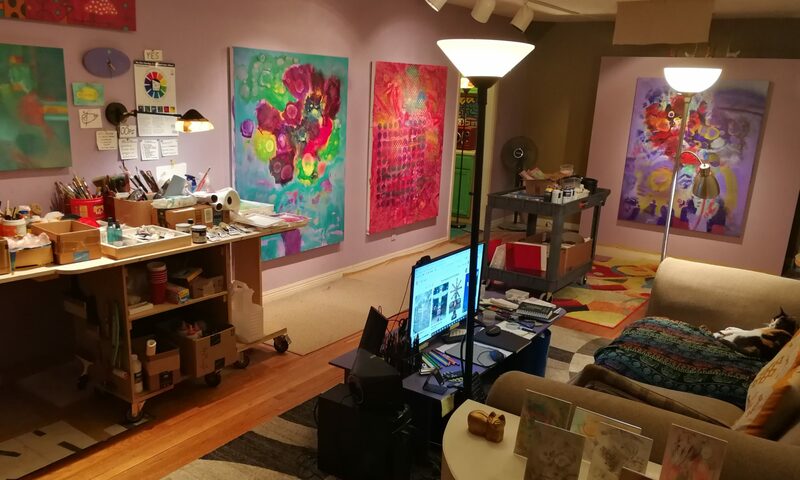 I asked if I could show her my work and heard, “Sure, do you want to come in today?” This was such a surprise to me I fumbled around and said, No, I can’t today, but tomorrow is good (what a big artist dummy I was…). The next day, I arrived at the gallery with my little sculptures in a cardboard box. haha What a presentation. I was a few minutes early, so I pretended to look at the art on the walls, but, yes, that’s what I was doing. A few minutes passed and she came in – but I didn’t know it was Leigh. She saw my box of art first and said, “Oh these must be Robert Terrell’s pieces! I LOVE THEM!” That was one of the best reviews I EVER HAD. I think I said, I’m really glad you like them, and then told her I was the man! haha We looked at the ones I brought – I think about 8 of them. I told her how I made them and what they meant to me. Friday came and I called (I think I did the calling). Leigh told me I’d gotten a thumbs up from the gallery committee, and that such great news – it was the beginning of my new life at age 31!! They started hanging my art, including some larger pieces (I will post photos of a couple of them). The first month with the gallery I sold two pieces for about $750 and $500 so I did the only rational thing – I quit my pretty good job at Texas Art Supply. And, No… that wasn’t the best idea I ever had. My wife and I began eating more potatoes than usual. My joining the gallery was still such a good experience for me… I finally felt like I’d achieved a real artist goal. Now other artists had a reason not to like me (they thought) – and some of them did seem to have some issues. They had more Houston connections, they had more art schooling…. oh well.